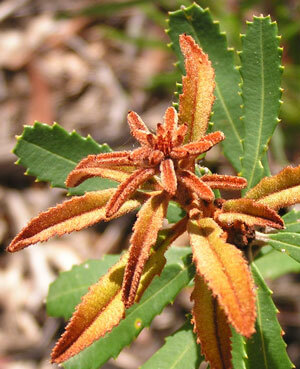 The Fern-leaved Banksia is so named because the rusty coloured hairs under its new leaves resemble the spores under a fern's leaf. The rusty hairs are confined to the main rib of mature leaves. Its botanical name refers to the oblong shape of its leaves. 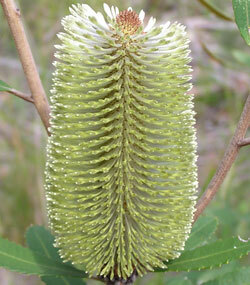 Flowering in early Autumn, this small to medium sized banksia can be found from Sydney along the coast and adjacent ranges into Southern Queensland. Its new growth is spectacular. Leather like in colour and texture, but soft to the touch, the new leaves could be considered a fascinating brown flower. 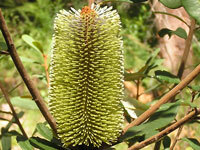 These photos were taken in the Lane Cove National Park.